When Quinn’s Fine Jewelry closed its doors in my hometown of Wilbraham, everyone was sad. No more little green boxes under the Christmas tree! My father was perhaps the saddest, as Denise Quinn, the owner, had made anniversaries and birthdays very simple for him for years - he knew to always check my mom’s wish list for the perfect sparkly gift. So Dad was awfully pleased when I told him Denise had gotten in touch with me about some branding - for her new shop on Cape Cod! After relocating to Falmouth, she and her husband Brian had the itch to have a storefront once again, this time embracing the heritage, culture, and aesthetic of the Cape that they love so much. They settled on the name The Gilded Oyster, in reference to an all-time favorite golden oyster piece her son had created. I rejoiced: gold foil EVERYTHING, please. 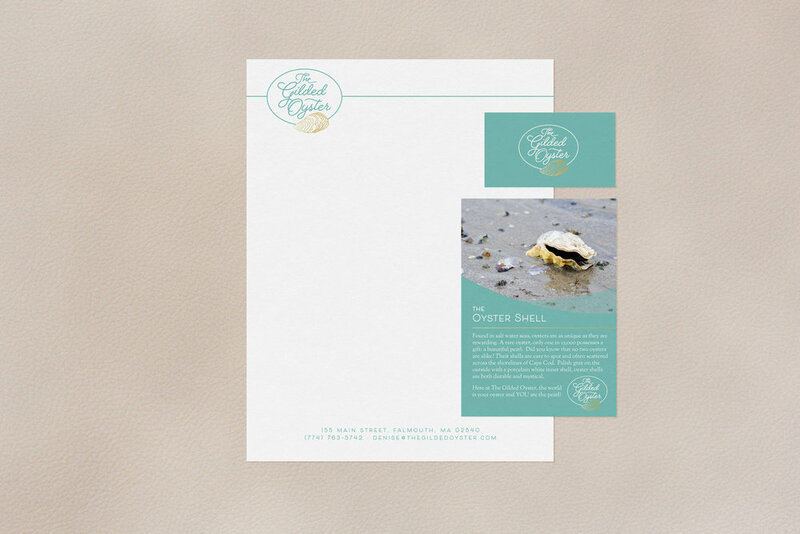 Denise wanted the logo focused on the oyster for which the shop was named. I played with that symbol in a few different ways, including adorning a little mermaid illustration with an oyster necklace (I had to try it), but the design Denise chose combined one of my all-time favorite script fonts with a simple line drawing. It reflects the elegant, natural designs characteristic of the shop’s jewelry collections, and nods to that timeless Cape Cod nautical aesthetic. Developing the branding and website was just as fun, and allowed me to gild to my heart’s content. Denise was after a calm, beachy look and feel and loved the combination of sea glass aqua with gold, so we brought that in to most all elements of her shop. My favorite piece was the business card - gold foil oyster! The sign for the front of the shop is going to look just like these; it’s in production now and I cannot wait to see how it comes out. I love the way all these pieces came together to bring a fresh, classy brand to Main Street in Falmouth. Now I just need to get over the bridge to check out the shop - Denise opened the doors just before Christmas! This was so much fun to work on, and I’m excited to see the Gilded Oyster flourish when visitors make their way to the shore this summer - my dad included. Oh, and a couple logo outtakes! Anyone want a mermaid logo?? ?